Construction boots are among some of the most durable and used type of work boot. In the normal workforce, it is mandatory to wear construction boots if you are going to be working in this industry. 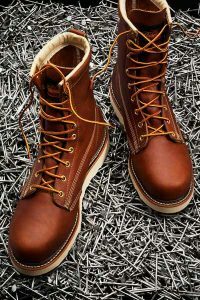 It is well worth investing in a good pair of these type of boots because of the important role they play in your work environment. You need to familiarize yourself with the safety rules that apply to the type of construction boots that are required for the job site you will be working at. One of the most common areas of the foot that can become injured on a construction site is the toes. It is not uncommon for heavy objects to be dropped on one’s toes. When this happens there is a high risk of the toes being crushed or badly severed. Construction boots that possess a quality steel toe built into them help to greatly reduce the risk of a serious injury. This area of the feet is also at risk and to safeguard them many construction boots are built with metatarsal guards that help to protect this area as well as the toes. Not only will this type of guard protect against heavy objects it will help protect the feet for those who work in certain industries like welding where hot materials could fall on the feet. The soles of the construction boots play an important role in protecting this area of the foot. They need to be constructed of heavy materials that can help to resist punctures from nails and other sharp objects. The sole also needs to offer support to your back and hips, to prevent and manage potential or existing back pain or injuries. Just as importantly they have to provide a good grip for the different types of surfaces that may be present in the construction site.